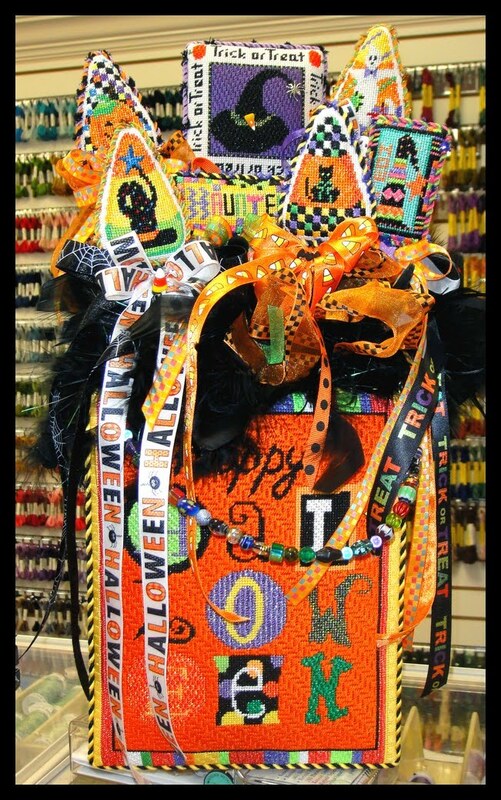 One of our wonderful out-of-town customers brought this adorable Halloween basket in the store to show off. 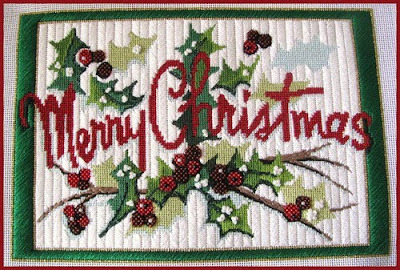 Lynn worked so hard stitching all of the little ornaments and then had them finished with wooden dowels and embellished with ribbon. 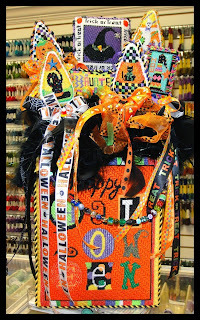 She also stitched the front of the basket (that piece is from Raymond Crawford). Didn't she do a great job?! Thanks, Lynn, for letting us feature your needlepoint. If you have any questions or comments about these pieces feel free to give us a call or send us an e-mail. We would love to hear from you! I’m Suzanne and I love needlepoint! I have a wonderful 17 year-old daughter, Anna Clare, and two sweet dogs, Holly and Winston, at home. My love of stitching began with crewel embroidery at the knee of my Grandmother when I was about 6 or 7 years old. I’ve been a “crafty” one all my life. While I still love all forms of sewing and needlework, etc., needlepoint is my favorite by a landslide. 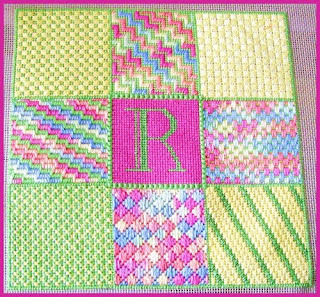 I had an idea about needlepoint but in my mind’s eye, it was a very boring craft using weird bulky “itchy” wool to created little slanted stitches on a warped piece of rug canvas. But then I moved to Lubbock and found out that it “ain’t my Grandmother’s needlepoint anymore”. 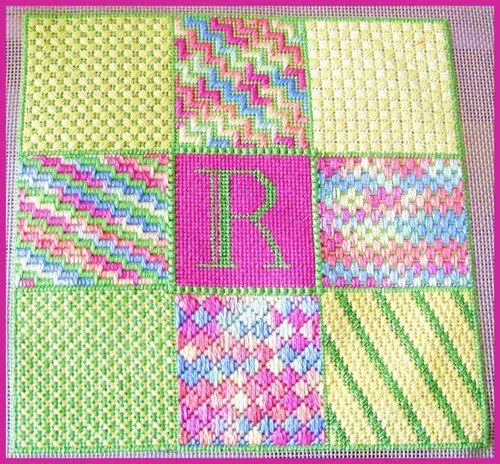 I learned about modern needlepoint in 2005 in a beginner class taught by the lovely Sara at Pocket Full of Stitches! I’ve been needlepointing almost daily ever since! 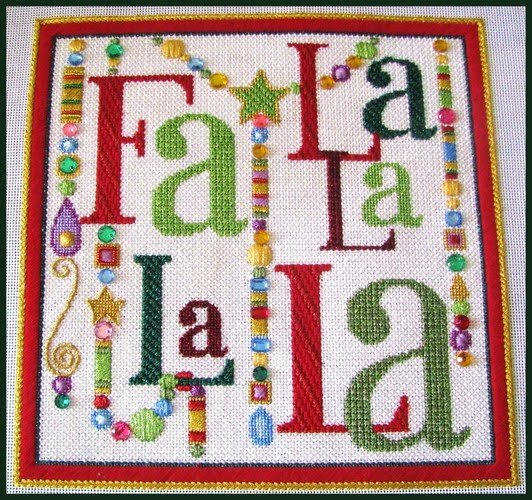 I am addicted to needlepoint! PFOS got it right when they called it “Stitcher’s Anonymous”. And here are a couple of my favorite needlepoint things…I’ve been struggling with how to store my stash and I finally found the perfect spot. I found an old Library Card Catalog from a local antique store…it’s perfect and holds all of my threads, stretcher bars, beads, and other supplies. Of course I color-coded my thread drawers! And we can’t overlook another favorite fixture in my house…the “Ort Jar”….where all of my scraps become a work of art….Love it! 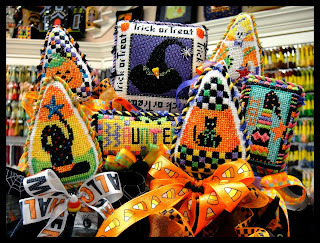 My mother is obsessed with needlepoint! 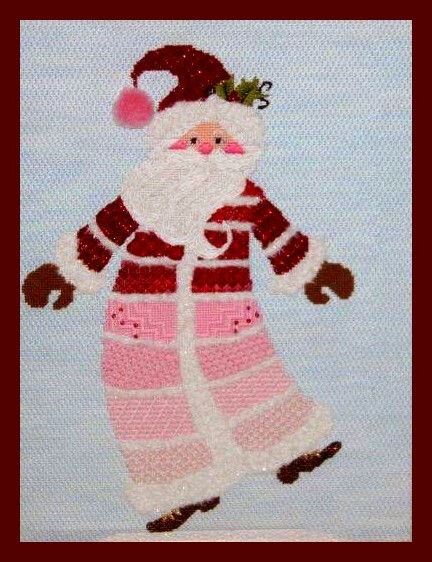 I remember when she bought her first canvas…a Dancing Rainbow Santa in primary colors. She took one look at that cute Santa canvas and imagined a whole different color scheme….PINK! That’s what I love about my mom; she puts her own unique fingerprint on every single piece she touches. My mom is so obsessed with needlepoint that she “speaks needlepoint” in our everyday life. 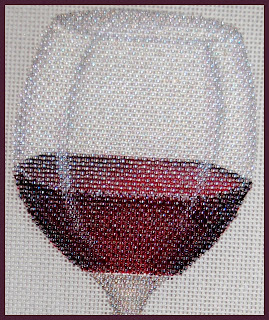 I don’t actually needlepoint, but I hear about it 24/7…seriously…I can spot the basketweave stitch from a mile away, over-dyed thread is my fav, and I can actually tell the difference between 14 pt and 18 pt canvas. Who designed that piece? Well, there’s a good chance I just might be able to tell you. In our house, instead of “Hello, come in and have a seat”…, it’s “Sorry that the sofa is full of needlepoint…do you mind sitting on the floor?” Or instead of “Come in, how are you?”, it’s “Come in, would you like to see my needlepoint collection?” Or…”Oh, well, would you like to see them all again?” Truth is, her needlepoint really is impressive and most of us don’t mind at all. In my eyes, my mom is pretty much the best stitcher in the world (I mean, c’mon… did you see her Santas?…or that wineglass stitched totally in beads?) Bottom line: I love my wonderful mom and am glad she found something she loves almost as much me. 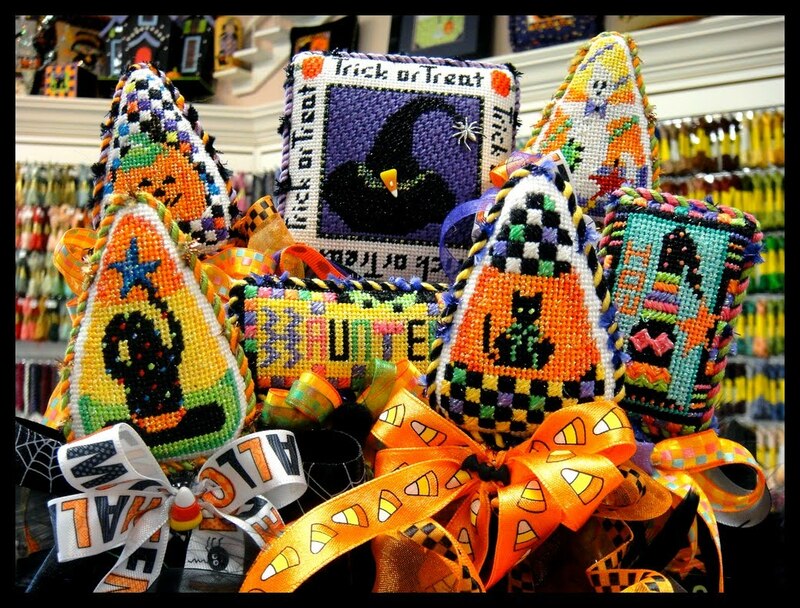 So if you ever get the chance to meet or stitch with my mom…don’t pass it up! 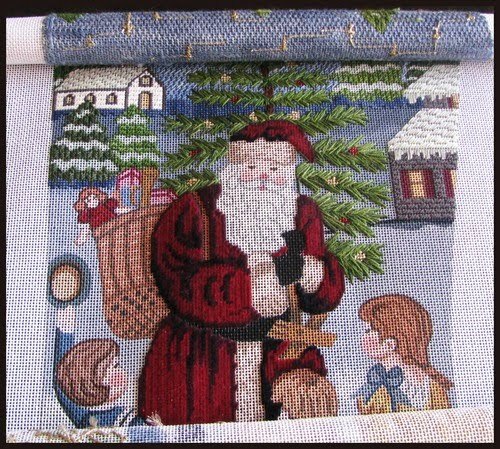 You may have spotted Suzanne's beautiful stitching previously on the blog - she stitched the Ewe & Eye & Friends reindeer that we featured here on May 15th. Check it out for more inspiration! This is my first EVER blog & I was SO excited and honored when Megan & Anna asked me if I would be a guest blogger for PFOS!!!! I'm also the PROUD mom to 2 dogs, Hilary-Jean & Hartley Sue and 2 cats, Hoch & Henry. There is a part of them stitched into every piece I do & I'm sure they will be incorporated into my blog spots! Here are a couple of my favorite pieces I've finished stitching. There are a lot more that I've started and I will share my progress with you! This stocking is one of those pieces. This one has a deadline, so if you see me in the shop, be sure to ask how it's coming! I'll keep y'all posted!!!! If you would like to know more about any of the canvases Robin is working on give us a call or send us an e-mail. We would love to hear from you!